Updated Tuesday February 5, 2019 by Mike Huisman. 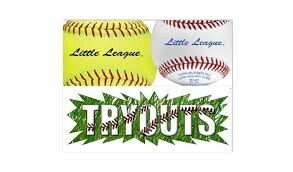 All players moving up to Major Leagues (Baseball & Softball) MUST come to tryouts! If you played AAA baseball and think you can play in the Major League Division instead of playing another year in AAA, you can tryout! Also, we are having a AAA Baseball tryout so the coaches are able to see ability of players to support a balanced draft. There will be no cuts at the AAA level! What do you do in tryouts? Catch a few grounders & pop ups, run a 60 yd. dash, hit 5-10 pitches in the cage, and throw the ball a few times to show arm strength and accuracy. Bring your mitt, bat, & helmet! See you on Saturday, March 2nd!